There are many unsung heroes at every sporting event and the NatWest Island Games is no exception. For every sport at the Games a Technical Committee is appointed to work closely with the Host Islands to ensure that the sports events are managed professionally. The members arrange for updates to the Sports-By-laws, help to find qualified officials and deal with any appeals during the Games. One of these heroes is Ricky Weir who has been the Chairman of the Football Technical Committee since 2011. 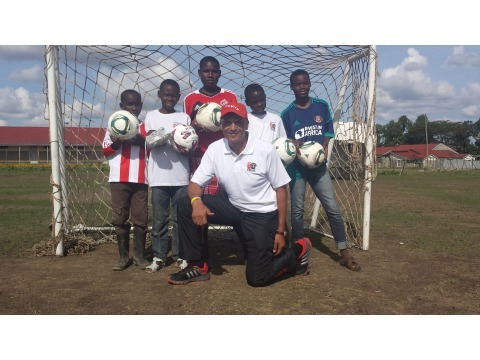 He has now diverted the benefit of his football knowledge and background developed from over 40 years as a player, coach, manager and Island FA president from his adopted homeland of Jersey to the slums of Nairobi. Jersey 2 Africa 4 Football Foundation whose mission is dedicated to improving young lives in Africa through the power of FOOTBALL is a Jersey based Non Profit organisation & charitable trust set-up by Weir, a former Jersey Footballer of the Year during his playing days and more recently a President of the Jersey FA (2006-2012). It's formation stemmed from a visit to Nairobi in Nov 2012 with the simple intention of helping to distribute locally donated sports kit to children and adults in the Mukuru slum, which forms part of the Embakasi district, home to over 1 million people living in complete squalor most with no electric, running water or sewerage services. The principle aim of his trip was to give a hand redecorating a local school run by Jersey residents Paul and Gill Bell, but on the first day after being greeted by well over 100 young footballers and their coaches, Ricky was asked if he would do some coaching. Despite some significant challenges, principally lack of equipment and a shocking pitch, he found himself putting his boots back on after 10 years and conducting numerous coaching sessions involving over 250 players under the hot African sun teaching and coaching on a rock strewn football field. Twelve days of hands on involvement with coaching, supporting, managing and teaching players, coaches, management and officials created the desire for Ricky to help them going forward in a sustainable way, which then created the inspiration to form the Jersey 2 Africa 4 Football Foundation, which was formed on 18 January 2013. Delivering classroom planning and coaching sessions for coaches and officials.